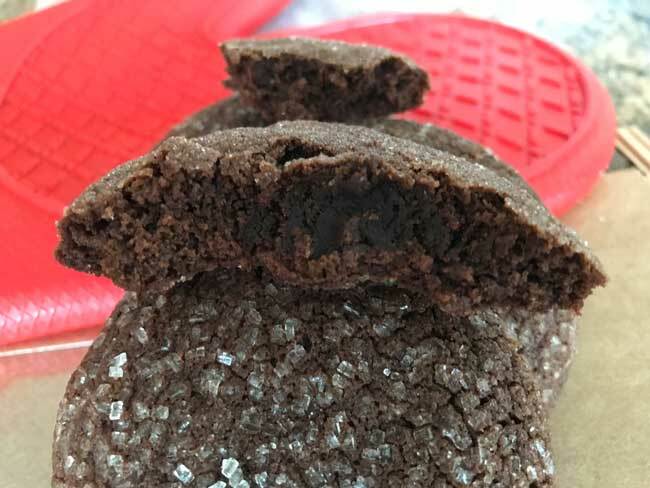 My personal preference would be double fudge cookies or something with more chocolate and less sugar, but for those of you who like the idea of chocolate sugar cookies, here’s a recipe. My family loved these, noting the chewy texture. And apparently America’s Test Kitchen loved them too since they put the recipe in their cookie book. Adapted from The Perfect Cookie: Your Ultimate Guide to Foolproof Cookies, Brownies & Bars, these are worth a try if you like really sweet, chewy cookies. As mentioned, my family thought they were good as did Arthi at The Pittsburgh Post Gazette. I’m interested to hear what you think, so if you try the recipe let me know! At least they are pretty. Update: I feel like I was a little hard on these cookies so I’m going to try them again with a different brand/type of cocoa powder — maybe Dutched this time. Even though I used a perfectly good cocoa powder, different brands have different flavor profiles and fat levels. Cook’s Illustrated published a very helpful article about this back in April. Preheat the oven to 350 degrees F. Line two baking sheets with parchment paper or just have ready two ungreased baking sheets. If you haven't already, melt your butter and allow it to cool. The best way to do it is to melt 10 tablespoons of the butter completely, then add the remaining 4 tablespoons of butter and stir until melted. Whisk flour, cocoa, baking powder, baking soda and salt together in a bowl. Whisk together brown sugar, vanilla, and melted butter until no lumps remain, scraping down bowl as needed. Whisk in egg and yolk until smooth. Stir in flour mixture until just combined. Spread granulated sugar in a shallow bowl; set aside. Working with 2 tablespoons dough at a time, roll into balls. Then roll in granulated sugar to coat; space dough balls evenly on prepared sheets. Alternatively, you can scoop dough with a large cookie scoop. Using bottom of dry measuring cup, press each ball until 2 inches in diameter. Evenly sprinkle remaining granulated sugar over cookies. Bake 1 sheet at a time until cookies are slightly puffy and edges have begun to set (cookies will look raw between cracks and seem undone), about 15 minutes, rotating sheet halfway through baking. Let cookies cool on sheet for 5 minutes, then transfer to wire rack. Let cookies cool completely. I used Ghirardelli natural but I think a Dutch chocolate such as Guittard Cocoa Rough would also be good. Thanks so much for double-testing this one! I’ll bet part of the reason yours were better was the Dutch process cocoa. I’m going to try them again with Dutch process to see if they are tastier and flatter. My family liked them, but I feel like they could be better. I just looked at your photo again. Mine are a bit flatter and more crackled. I didn’t have course sugar so I rolled them in regular sugar. They’re very attractive. I’ve been wanting to bake cookies and you gave me the perfect excuse. It helps that I had all of the ingredients on hand. I think they’re great! The sugar cookie texture is spot on. I really like the texture. I think because I had the benefit of reading your post before tasting I don’t think they’re too sweet. Yes, they’re sweet but they are “sugar cookies”. They are also very attractive. It would be fun to make them and put a little cayenne in them. I think it would knock back the sweetness a bit and make them more interesting but that said I would make them again just like this and be happy. I used Bensdorp Dutch Process cocoa from King Arthur just because I had it and it was either that or Ghiradelli natural. I also think these might make excellent ice cream sandwiches.